This resort is the best of the best. Located on the private island of Tetiaroa which is around 30 miles north of Tahiti. The hotel is the epitome of luxury, combining style and elegance with pristine nature. The island is surrounded by a beautiful lagoon which provides a great location for many activities including scuba diving and snorkelling. There is an abundance of wildlife which lives there including sea turtles, manta rays and all kinds of exotic fish. 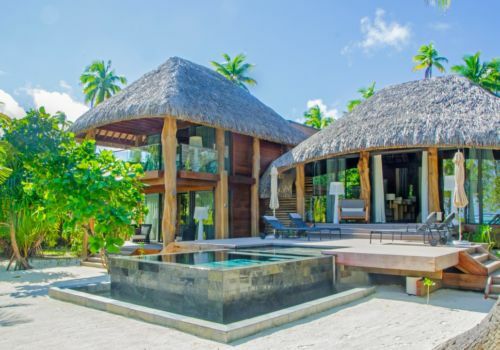 Whilst everything is designed with luxury at the forefront, the resort still has an authentic feel to it which reflects French Polynesian culture. Stay in either a one, two or three bedroom villa, all which are situated right on the beach. The Brando was where Barack Obama stayed when he was ‘Out Of Office’ and is also where Pippa Middleton and her husband James Matthews honeymooned. The island can only be accessed by private seaplane which makes it ideal if you are looking for an intimate experience. The rooms are all light and airy, giving you the sense the beach blends in with the villa. The cosy sitting room is fitted with a sofa and chairs which leads onto the media room where you can watch a movie or listen to music. On the other side is the spacious bedroom which is furnished with a beautiful king size bed and plenty of storage space. The large windows provide a fantastic view of the lagoon. There is also a luxurious ensuite bathroom which includes an outdoor bathtub. Outside, there is a beautiful wooden terrace area and a plunge pool. Enjoy all the features of the one bedroom villa plus more. With a second bedroom and a larger living space, your stay is sure to be very comfortable. As well as the sitting room, you will also have a private dining area which can seat six. There is also a kitchen and a two-tiered deck outside. Both bedrooms have ensuite bathrooms, the downstairs bathroom also has an outdoor bathtub. Enjoy the private terrace area outside which includes a larger plunge pool. These villas are ideal for larger groups or families. With three bedrooms all with ensuite bathrooms, there is plenty of space for everyone. The third bedroom is accessed by an above ground walkway and has a private dressing room along with a bathroom and spacious bedroom. The living area is the same layout as the two bedroom villa but with even more space. Outside, you will find a large wooden deck with sun loungers and a large plunge pool. You’ll need to fly into Papeete in Tahiti from where you’ll board a smaller aircraft for the short, but the spectacular 20-minute flight with Air Tetiaroa. Flights operate from Los Angeles to Tahiti as well as direct flights from Auckland and Tokyo. The resort has two restaurants which showcase food from all over the world including traditional French Polynesian cuisine. All fruit and vegetables are grown on in the gardens and orchards on the island and all dishes are carefully crafted with the freshest ingredients. Enjoy stunning views of the beach and the lagoon, you can dine inside or outside. The restaurant provides a range of dishes including many traditional French Polynesian dishes along with classic French cuisine. This restaurant is the perfect place to dine if you are looking for an intimate experience. Situated on a moat which is surrounded by the beautiful lagoon, you get the wonderful sense that you are floating into the sunset. The restaurant provides a fine dining experience and serves delicious French cuisine. With a world-class wine cellar which is temperature controlled, you will find a wide selection of wines to accompany your food. This open-air bar is located on the second floor of the main hotel building and provides some of the best views of the lagoon and beyond. The perfect place for an evening cocktail. This relaxed bar is an ideal place to chill during the day. It is a very sociable place and great if you are looking to meet new people. Order in and enjoy a delicious meal in the comfort of your own villa. Nestled on a tranquil pond, if you are seeking the ultimate relaxation experience then this spa will tick all the boxes. With a wide selection of holistic treatments offered you will leave feeling refreshed and rejuvenated. Using traditional Polynesian remedies and techniques, this spa provides a totally unique experience. It blends in beautifully with the environment and there is an outdoor area for you to relax in after your treatment. Whilst The Brando is most definitely one of the best desert islands in the world, there are plenty of activities to keep you occupied during your time in French Polynesia. From snorkelling and diving to cycling and paddle boarding you are immersed in nature. With a fantastic coral reef, you’re likely to encounter sea life such as turtles, reef sharks, rays and thousands of tropical fish. The resort also boasts a Library and Explorer Centre in which you can read books about the region or take part in demonstrations about Polynesian culture, lifestyle and history. The Brando’s own research scientists will also show you their work and talk to you about their research and marine life found on the atoll. If you visit between July and October, you’ll also be able to go on a whale watching tour.